Christmas was just around the corner and Burnley folk were being warned of the concerns at getting dogs for Christmas as family pets. We all know that there are too many cases of dogs quickly being discarded after the festive period but the worries were much deeper in town. By the end of November Burnley's dog warden service had already picked up 873 stray dogs. It was a worrying trend and was more than double the total for the previous year. A word of warning then not to spend your money on a dog unless it was wanted and was going to be given a good home long term, but there was no problem spending your money on a horse or two as one Burnley man found out. He enjoyed an occasional Saturday flutter but never spent more than 20p in bets. He did a 'Lucky 15' bet with the full 20p and scooped £5,702 when it came up with his last winning horse called Simple Pleasure. The Lancashire Free Legal Action Centre, based in Blackpool, had been set up to help those with problems paying their poll tax, particularly those being jailed in Burnley for non-payment. They'd asked councils for grant funding. Burnley saw this as very much turkeys voting for Christmas and allowed the request to fall on deaf ears despite pleas from MP Peter Pike to support it. They might not have been up for that but were very much enthusiastic when it came to clean cups and saucers. The council were so keen to help kitchen staff at the Town Hall thay they purchased a new dishwasher for £1,400 (yes, you've read that correctly - one thousand four hundred pounds). Councillor Richard Robinson said: "Environmental health standards in that kitchen disgust me. I'm not blaming the staff at all. They do their best in very difficult conditions. "We as a council should set an example. If it was an outside kitchen or at a cafe things would be being said. We expect other people to have hygiene standards and we should be keeping them ourselves." He had full support from Councillor Irene Roberts but Councillor Kath Reade was not convinced and replied: "I would be proud of this committee if we showed an example of cutting down on spending ourselves, and spent the money on the people who really need it." Councillor Reade was on a loser and the vote to remove a new dishwasher from the spending programme was defeated. There were also more traffic problems for the council to consider. A week ago we reported that Councillor Enid Tate was complaining about motorists using Todmorden Road like Brands Hatch. Now it was the turn of Brunshaw Road with Councillor Arthur Park joining residents with demands for action. An angry Councillor Park said he was aware of five accidents in the last 14 months and he and the residents were convinced that it was an accident time-bomb waiting to go off. The residents wanted a reduction in the speed limit and a controlled crossing near the junctions with Brownhill Avenue and Brunshaw Avenue. One elderly resident said crossing the road had become impossible with all the traffic going at speeds of at least 60mph. Three months had passed since the murder of 73-year-old Kenneth Howard of Mizpah Street, just off Brunshaw Road. The police were no closer to solving this and now believed someone must be shielding the killer. An eight man team was still investigating but with no current leads after over 1,000 interviews. Detective Chief Inspector John Thornley admitted: "I can't help thinking that someone - a parent, friend or relative - knows who is responsible." A couple of slightly less serious crimes were reported. A 22-year-old man was sent to jail for starting a fire in a warehouse because he was bored. He was fed up so set fire to a pile of wood with a gas canister. He also admitted to a charge of arson at the Pizza Factory Restaurant in Gunsmith Lane and was sentenced to two and a half years in prison for each offence, to run concurrently. Have you seen anyone recently wearing a dodgy looking mustard coloured jacket, a red snowsuit or a red sweatshirt? If so they could be the ones stolen from the Trend Shop in The Mall in Burnley. I know we shouldn't be heralding a crime but I did think this one was somewhat ingenious. The thieves used a long instrument and pushed it through the letter box to remove the items from a dummy close to the door. I bet they wished the window dresser had put something a bit more acceptable on the dummy. I mean - a mustard jacket and a red snowsuit! There was some sad news with the passing of The Baroness Hart of South Lanark at the age of 67. The Baroness, who was known as Judith Hart before receiving her title, was a former Labour MP who held offices such as Minister of State at the Commonwealth and Minister of Social Security. She was once tipped to become Britain's first woman Prime Minister but probably missed out having not come from a grocer's shop in Grantham and neither did she have a son who managed to get lost in the desert. She was, in fact, born Constance Mary Ridehalgh, daughter of a Burnley Express employee, and she resided in Ennismore Street Burnley. She adopted the name Judith for herself at the age of 12 whilst Hart was her married name. She'd served in the Governments of both Harold Wilson and James Callaghan and had remained in Parliament until 1987 when she started her fight against cancer, a fight she finally lost four years later. One old lady of 86 named watching Ken Dodd on television as her favourite pastime, so much so that she wrote to the 64-year-old comedian to say thank you. She was thrilled to get a reply so in November had sent him a birthday card along with a small donation towards Ken's favourite cancer charity. She received another lovely letter with Dodd thanking her for the donation. However, he explained that he couldn't claim back any Gift Aid as he was a non-tax payer. Finally, ahead of the football, there was much sympathy for 60-year-old Danny Lord who certainly lost the track of time whilst shopping in town. Having forgotten to wear his watch he told the Burnley Express readers how he'd struggled to get an accurate time with all four sides of the Town Hall Clock showing different times. Burnley Football Club that week released their accounts for the 1990/91 season and it was good news. The club was back in the black having turned a deficit of £99,841 into a profit of £75,850. It was the best financial position the club had been in for a very long time with assets now outweighing liabilities. The biggest increase in income had come via the turnstiles whilst it was reported that the annual wage bill had increased from £558,273 to £667,950. Ahead of the home game against Scunthorpe United, as the Clarets looked to equal a club record of ten successive league wins, manager Jimmy Mullen was able to name the same team that had beaten Rotherham United in the FA Cup a week earlier. 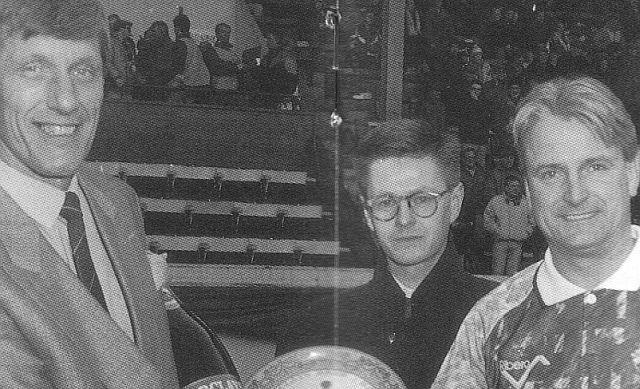 With the same substitutes named, there was no place in the squad for new signing Adrian Randall who would be given more time to settle in before making a debut. Ahead of kick off a minute's silence was observed for former Blackburn Rovers chairman Bill Fox whilst a more pleasant event was the awarding of the Manager of the Month Award for November to Jimmy Mullen. The fans then took their places for what was going to be league win number 10 since the new manager had replaced Frank Casper at the beginning of October. Unfortunately it all ended in disappointment with Scunthorpe, often a bogy team for the Clarets, going home with a point from a 1-1 draw. Burnley were, without doubt, the more adventurous side and dominated the first half with the visitors content to sit back. It was just that on this occasion we didn't click in front of goal as we had been doing. We had so much possession but all too often the final ball let us down. Crosses were often played in too close to goalkeeper Phil Whitehead whilst too often passes were cut out by alert defenders. It was difficult to be critical with us being by some distance the better side. Almost from the kick off John Francis set up Roger Eli only for Eli to head wide of the target whilst the easiest chance of the afternoon was fluffed by Andy Farrell who somehow missed the target from right in front of goal. He might have missed that chance but he was on the mark soon after. Joe Jakub played a free kick into the area. It was superbly brought down by Eli who looked a certain scorer. Whitehead did even better to save but, from the tightest of angles, FARRELL squeezed the ball home between goalkeeper and post to give Burnley the lead. That was just past the half hour and we took that lead into the interval. Nothing changed in the second half. We missed more opportunities and there were concerns that we would pay the price, and we duly did with just over a quarter of an hour to go. Scunthorpe won a corner. David Hill took it and in a crowd of players it was PENDER, the Burnley skipper, who got the last touch to head it past his own goalkeeper Chris Pearce and give Scunthorpe the equaliser. From that point to the final whistle it was a different game as Burnley were forced to hang on and twice substitute Jason White should have won it for the visitors and twice Steve Davis came to our rescue, once with a deflection and then with a fine tackle. Thankfully we survived the late onslaught and although the winning run had come to an end we'd remained unbeaten and were still second in the league. After the game, Jimmy Mullen said: "Last year we would have lost that game, but today we defended magnificently in the last 20 minutes when they hit us hard. "We knew that they would make life difficult for us and I give Scunthorpe full credit for coming to Turf Moor and performing very, very well. We haven't won the game, but we haven't lost it either and that's the most important thing. "We know that winning every game is impossible, but the psychological boost of not losing is very important." He added: "Something was missing today up front. Our final ball was wrong or we took the wrong options. The killer instinct just wasn't there." 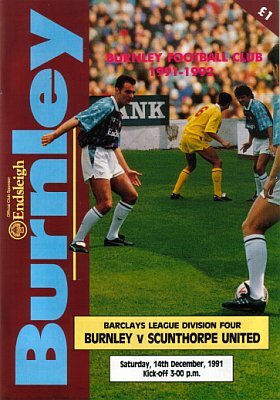 Burnley: Chris Pearce, Ian Measham, Joe Jakub, Steve Davis, John Pender, Andy Farrell, Steve Harper, John Deary (Mark Yates 73), John Francis, Mike Conroy, Roger Eli (Graham Lancashire 73). Scunthorpe United: Phil Whitehead, Joe Joyce, Paul Longden, Dean Martin, Stuart Hicks, Gary Hyde (Jason White 84), Graham Alexander, Ian Hamilton, Tony Dawes, David Hill, Ian Helliwell. Subs not used: John Buckley. The weather disrupted the fixtures and that meant we'd have gone top of the league had we won as Mansfield Town, the league leaders, were one of the teams left without a game. 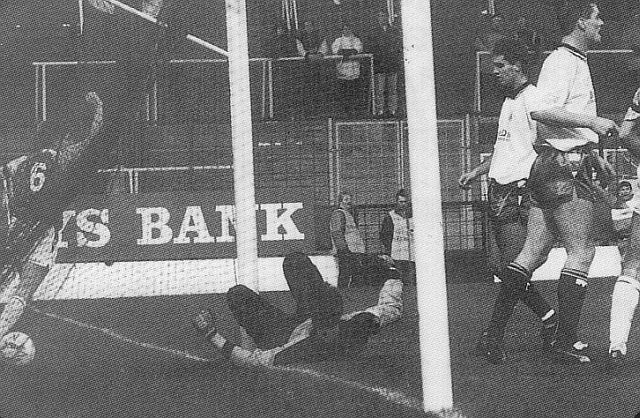 Even so, our position was strengthened with fourth place Blackpool suffering a surprise 4-2 defeat at Rochdale. Burnley were now set for an away game against Aldershot who were reported to be in serious financial difficulties. They were next to bottom in the league and a sixth successive away win was surely on the cards.